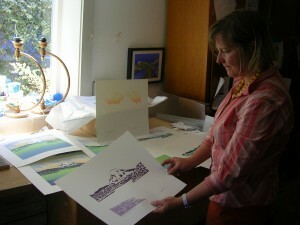 I visited Kristina Hagman at her studio in Seattle [in August 2009] to talk with her about her new woodblock printwork. Kristinas’ Woodblock Print “Night” is on the cover of the new DANIEL SMITH 2009-2010 Reference Catalog. This Woodblock Print is just one from her series “Thirty-Six Views of Mount Rainier”, inspired by Hokusai and his woodblock series Thirty-Six Views of Mount Fuji. Kristina also wrote an article for DANIEL SMITH about how she was inspired by Mt Rainier and Hokusai to make this series that you can read HERE. 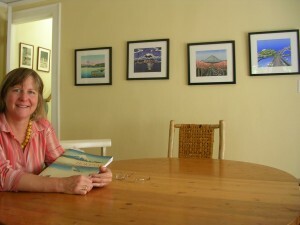 When you enter Kristina’s Seattle Craftsman home you see about 7 framed prints of her series of 36 views of Mount Rainier on the pale yellow walls of her home. Two on either side of the fireplace, two on the wall opposite above shelves, four on the wall near the dinning room table, another on the same wall on the other side of the door to the kitchen. Kristina invited me to sit at her dining room table to show me some of Hokusai prints in a book on the work of Artist Hokusai that she pulled from a nearby shelf filled with art books. One of the prints Kristina talked about was “The Great Wave of Kanagawa” (his most recognizable work) with the tiny Mount Fuji seen in the distance. When you look carefully you can see that the mountains’ shape is also roughly repeated in the shape of a smaller wave. With Kristina’s woodblock series, “Thirty-Six Views of Mount Rainier” , Kristina is not trying to find corresponding views of Mount Rainier to Hokusai’s “Thirty-Six Views of Mount Fuji” in her series, but rather the spirit of Mount Rainier and how everyone in it’s vicinity sees it juxtaposed in their day-to-day activities and lives. Mount Rainier is so huge, and stands so alone in it’s surroundings that it becomes a personal reference point to everyone in Seattle and south Puget Sound, just as Mount Fuji does for everyone in Tokyo and central Japan. Then we went downstairs to Kristina’s Studio! 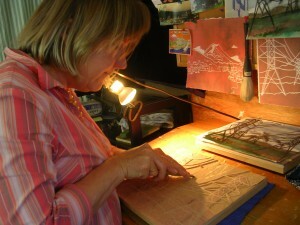 In her studio, Kristina first showed me the four woodblocks she used for the print “View from Georgetown“. We talked about the peculiar cloud formation that occurs over Mt Rainier, called lenticular clouds that look kind of like UFO’s. 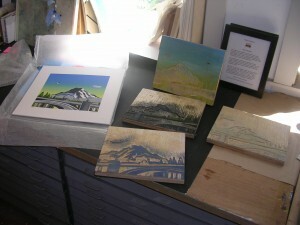 Kristina has carved a lenticular cloud into the woodblock which is appropriate for a view from Georgetown, the quirky little Artist community just about 2 miles southeast from the DANIEL SMITH Seattle Store. Kristina told me that she began working with DANIEL SMITH Printmaking Inks in 1983 when she was in New Mexico studying printmaking, funny how she now has one of her prints 26 years later on the cover of a DANIEL SMITH Catalog! Kristina showed me a set of Progressive Prints of her print “Dawn” which is basically the print deconstructed. Each paper is of just one of the woodblock prints with it’s particular ink color. If you *click* on the link to see the print (it’s the 3rd from the left at the top) you will see subtle “waves” in the water of Lake Washington, those “waves” are actually the wood-grain of that particular woodblock. That was an artistic decision to choose a woodblock that had wood-grain that resembles waves, and to incorporate that wood-graining into the print. It takes careful printmaking to bring out the wood-grain. You can see some wood-grain in the sky of “Night” which is on the cover of the DANIEL SMITH 2009-2010 Reference Catalog, they echo the general shapes of the night clouds. Next Kristina showed me her wood cutting tools nestled in a nifty segmented box, a cigar box/tray that someone had given her. I asked Kristina where she actually worked when carving the woodblocks and it turns out to be a lectern that she picked up at a thrift store. It’s the perfect height for Kristina to stand at to carve. Kristina picked up one of her woodcutting tools and began to carve the woodblock laying on the lectern to show me how she works. That woodblock is an interesting one with Mt Rainier in the background of the Giant Transformers and Power Lines that run along the spine of Beacon Hill. Below those power lines is a Park/Trail called Chief Sealth Trail. It’s interesting to know that Seattle City Light has purchased, for it’s Arts Collection, some of Kristina’s prints from this series, since those power lines in this new print belong to Seattle City Light. It was fascinating to meet Kristina Hagman, to see her studio, talk about her current body of work, and for me to see some of her work in progress! Kristina is now working on woodblock print number 25 of the 36, with the goal to finish by this spring for a show at Seattle University to inaugurate their new Gallery Space. Kristina will do a lecture on her series, Thirty-Six Views of Mount Rainier there too, that will be a very interesting lecture! Note to readers. This was the first Artist Interview article I wrote, first of 3 articles about Kristina Hagman, the first 2 were for DANIEL SMITH for the DANIEL SMITH Blog. I am a Real Estate Agent/Broker in the Seattle/Bellevue areas, and I believe that the business of Real Estate is an Art. If you have (or someone you know has) questions about Real Estate in the local area or needs help, please contact me, I would love to talk with you! This entry was posted in Artists and tagged Artist, Kristina Hagman. Bookmark the permalink.